The most popular mount for a Garmin Nuvi GPS is the Garmin Portable Friction Mount. The mount is manufactured by Garmin and is an extraordinarily popular mount. They officially refer to it as the portable friction mount but I still call it the Garmin bean bag mount. It has been available since the days of the first Garmin Nuvi which ironically is the model shown in the photo that accompanies this review. The Garmin bean bag mount weighs 1.5 pounds. The bottom of the mount features a rubber coated base which is designed to stay put in most normal driving circumstances and most typical dashboards. Note that I use the word “most” because if your dash is slanted downwards and you stop short, the GPS will likely wind up on the floor. Additionally, if you have oiled your dash, there is a good likelihood that the mount will slip off onto the floor as well. Speaking of short stops, these mounts can present the danger of becoming a projectile with a violent stop because there is no adhesive keeping it on the dash. You simply plop it on the dash and it stays there because the bottom has the rubber coating but when you stop real short all bets are off and the mount will likely become mobile. There are other companies that make a somewhat similar bean bag mount that includes an adhesive safety anchor, if interested in these types of mounts, consider the Arkon CM012 which works in conjunction with your current suction cup mount. Like the Garmin mount, the Arkon entry weighs about 1.5 pounds. 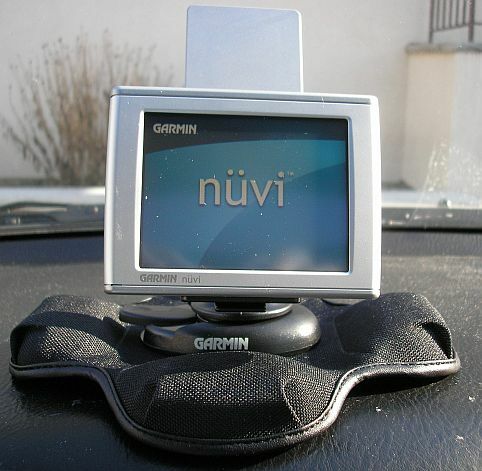 The Garmin Nuvi line which was introduced in 2005 features a cradle that has a 17mm socket on the back. This Garmin mount has a ball attached to it that measures 17mm. That means they fit all the Nuvi models made since the beginning. Unlike the Arkon entry, this Garmin bean bag dash mount does not require your suction mount but will need the cradle that came with the mount. The cradle can easily be removed by holding the suction mount in one hand and pulling the cradle off using your other hand. Once you get the cradle off the suction mount. it can snap right onto the bean bag mount. Once you push the cradle onto the 17mm ball on the mount, the hold is tight yet the GPS can be angled from side to side with one hand while the mount is seated on your dash. A nice advantage of this Garmin bean bag mount is portability. When traveling, just take the entire mount with the GPS attached to it off the dash and pop it into your luggage. Be sure though, to take the mount with you when leaving the airport on your way home, as way too many people wind up buying another mount because they left it in the rental. I’m betting there are hundreds of used mounts sold on eBay from Avis and Hertz guys that clean out the car because when you call the airport they never seem to be able to locate the stranded mount. A drawback of these mounts is the limitation of intended audience. The mounts are manufactured by Garmin to fit their GPS line. These are not universal mounts. Fortunately some kits are available so that you use these to mount a phone. These are nice additions if you have migrated your GPS use to your cell phone. Read our article using your Garmin mount for stuff other than a GPS here. These mounts are very well made and extremely durable. The nice part about these mounts is assuming that Garmin does not change the basic design of their Garmin Nuvi GPS units, these mounts can be used with your future upgrades. It’s just a matter of swapping out the cradle. Unlike some other mounts manufactured by Garmin, the Garmin Portable Friction Mount represent a good value for use with your Nuvi. It’s a very well made mount and easy to use.